Looking for a great way to tip your hat to the birthday boy or girl? Look no further than the Assorted Happy Birthday Cake Top Hats! The hats come in assorted colors of yellow, red, blue, and green. The hats are made out of a plastic material and come with a cardstock band featuring the words "Happy Birthday" and a picture of cake and candles. 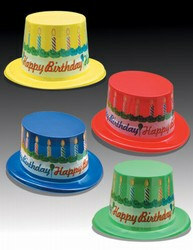 The Assorted Happy Birthday Cake Top Hats fit a full head size, so they are perfect for both children and adults! The lightweight, durable hats can be used for birthdays year after year, and you can even decorate the hat's smooth surface with paint or decorations! For more birthday hats, check out the Bulk Assorted Foil Cone Hats and the Fringed Foil Sweet 16 Birthday Party Hat!